Crowley, T.E., T Pain & F.R. Woodward. 1964. A monographic review of the Mollusca of Lake Nyassa. Annales Musee Royal de l’Afrique Centrale 131: 58 pp., 8 pls. Nyassunio ecclesi Crowley et al., 1964. Woodward in Crowley et al., 1964, Annals Mus. R. Afr. Cent. : 52, pl. 6, figs. 39-40. 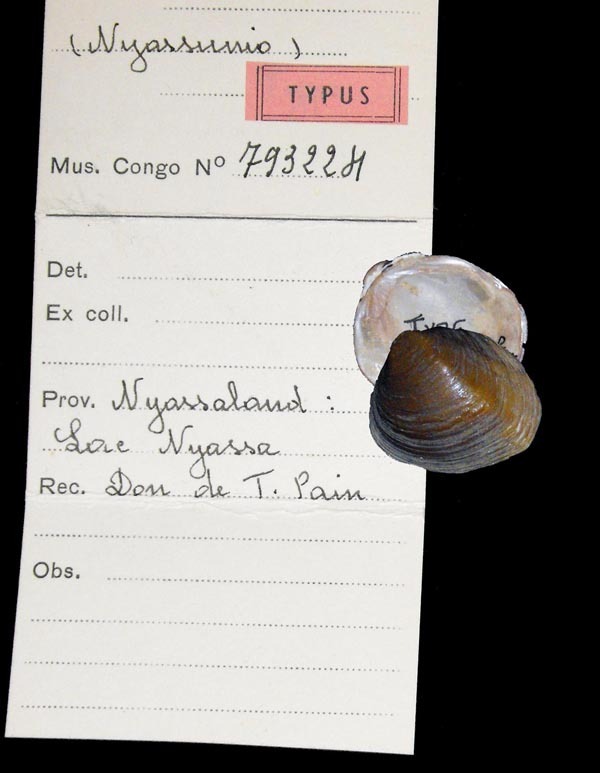 Type(s): HOLOTYPE MRAC_793224, Nyassaland: Lac Nyassa. Aspatharia (s.s.) subreniformis (Sowerby, 1867). — Crowley et al. (1964: 36). Aspatharia (Spathopsis) nyassaensis (Lea, 1864). — Crowley et al. (1964: 38). Grandidieria bloomeri Crowley et al., 1964. — Crowley et al. (1964: 53). Indonaia mossambicensis (von Martens, 1860). — Crowley et al. (1964: 55). Mutela alata alata (Lea, 1864). — Crowley et al. (1964: 42). Mutela alata simpsoni Ancey, 1894. — Crowley et al. (1964: 44). Nyassunio ecclesi Crowley et al., 1964. — Crowley et al. (1964: 52). Nyassunio nyassaensis aferula (Lea, 1864). — Crowley et al. (1964: 50). Nyassunio nyassaensis hercules (Preston, 1913). — Crowley et al. (1964: 51). Nyassunio nyassaensis nyassaensis (Lea, 1864). — Crowley et al. (1964: 46).